E is for Explore! : Magic Numeral! Luckeyfrog's Lilypad created Magic Number Math, different math concepts that revolve around one number! I used this activity in the classroom and it was a hit! I cut out yellow stars and wrote various numbers on each one. Then, I mixed them up in a paper lunch bag and had kids pull one star out. 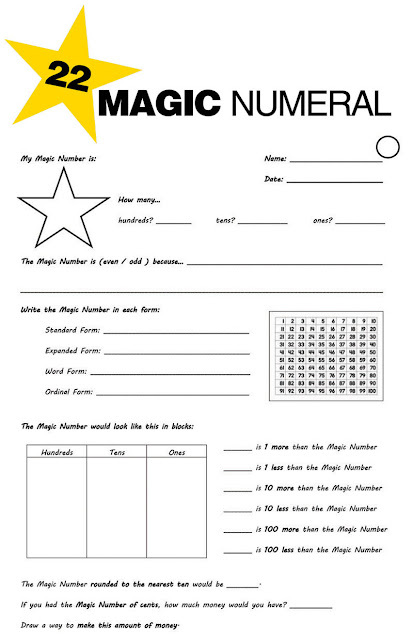 They used their magic number star to complete the math problems on the worksheet. Visit Luckeyfrog's Lilypad to download the freebie featured below!